By 7:50 PM with darkness closing in and the track moist from a persistent chill and low cloud cover, a light rain began as the boys 4 x 4 was completed. 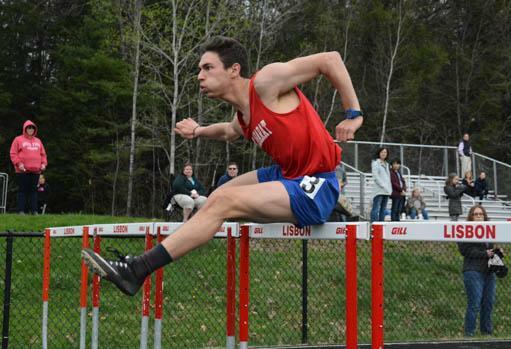 As expected in a meet featuring some of the larger programs from the KVAC, along with some programs from the MVC, the big squads had the numbers to claim the top spots even with some top performers absent, injured, or still working through event choices. Lewiston, Mt. Ararat, Waterville, Brunswick, Leavitt, and Lisbon had full squads. Buckfield which works out with Leavitt had a hand-full of competitors, and there were a couple of Oak Hill uniforms on the track too. Lewiston took the top spot for both boys and girls. The girls had 145 points. The Leavitt girls took second (140.5) followed by Mt. Ararat (121.25), Waterville (113.5), Lisbon (59.75), Brunswick (54), Buckfield (4), and Oak Hill (2). On the boys side, the Blue Devils' 163 points bested Brunswick's 140. Other teams scoring were Mt. Ararat (105), Leavitt (95.5), Lisbon (70.5), Waterville (70) and Buckfield (2). Connor Kaplinger of Lewiston stepped into discus circle without the benefit of a warm-up and threw 120-05 on his first effort; he ended the day with a 123-01, topping the afternoon's other best performer Rasheed "Big-Sheed" Parker's second-place throw of 115-01. Kaplinger also took the top spot in the javelin with a throw of 167-02, twenty-five feet more than he needed for the win. Kaplinger placed in the shot put too, but Waterville's Rasheed Parker nabbed the top spot with a throw of 42-6.5. Kaplinger scored in four events as he also placed in the 100 meter dash. At the same time Brunswick's 4 x 8 team, Daniel Lyons, Tyler Patterson, Cam Ashby, and Andrew Chingos got Brunswick off to a good start with a win in the 3200 relay at 9:04.05. Waterville and Brunswick split points in the pole vault as the Panther's,Taylor Bielecki, shared honors with Brunswick's Caleb Rand; both cleared 11-00, even on jumps, to top the rest of the field. But Brunswick left points on the table as both Ryan Olson and Michael McCrum who each cleared 11 feet at the Dragon's last meet, did not enter. Sam Cenescar of Brunswick jumped in at 5-8 in the high jump; he won the event with his first clearance as the remaining competitors were out at 5-6, so after taking 5-10 he asked to move the bar to 6-3. But as daylight waned and the last finishers of a very competitive 3200 were coming across the line, Cenescar failed to clear the height. The sophomore had also figured in the long jump taking third there. Dalton Streeter of Mt. Ararat went 20-03.5 for the long jump win, was third in the triple, and took the top spot in the 110 hurdles. The title in the triple went to Blue Devil Kamundala Crispin at 41-07; Crispin also took second in the long jump and placed in the 400. He was one of six Blue Devils to cross the line earning points in the 400 as Lewiston claimed second through seventh in the race. Lewiston conceded only the first spot to Mt. Ararat's Tyler Bernier (52.66). 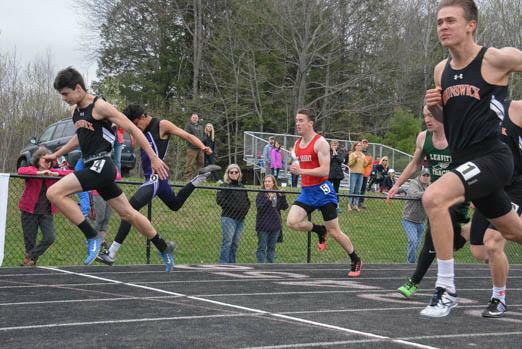 The dominance at the 400 led to a 4 x 400 win for the Blue Devils to close the meet; it matched an earlier a win in the 4 x 100 to put Lewiston over the top as they also collected points in the 200 where three Blue Devils placed. The second place Dragons were nearly as dominant at the 100 taking the top three spots and seventh place. Hunter Parker's 11.74, won the 100; he also claimed first in the 300 meter hurdles (42.84) and the 200 (23.69). Other individual winners on the day were Alan Lavoie of Lisbon who claimed first in the race-walk (7:33.44), and Nick Dall of Waterville with wins in both the 1600 (4:38.96) and 800 (2:02.68). Roy Varney of Leavitt took the 3200 from Mt.Ararat's Andrew Chamberland in a back-and-forth race that saw late lead changes before Varney squeaked out the win at 11:03.85. It was a fine race but both will need to do better to qualify for their respective state meets. On the girl's side the Leavitt Hornets are the defending Class B KVAC Champion and appear to be good shape to defend, as Class A Lewiston just sneaked past Leavitt in this meet. The Hornets were able to amass their 140.5 points while winning just one event off the track. Keragan Davis took the high jump going 4-08, but the Hornets strength on the track was plain as they took both the 4 x 100 and the 4 x 400 relays. In addition they grabbed wins in both hurdles as Kristen Roux ran the 100 in 17.44 and the 300 in 52.08. Ava Petrin won the 400 for Leavitt, while Nicole Daigle took the 100. But in most of theses races Lewiston was nearby. Maria Bellegarde took 2nd in both sets of hurdles. In addition to winning the 200 Taylor Chamberlain took second in the 100, as three other Blue Devils also scored . The only race the Hornets could truly dominate was the 400 where four of seven places went to Leavitt while Lewiston failed to place. The difference maker for the Blue Devils proved to be the throws. Brooke Cloutier took the javelin (86-06), Laila Bunnitt won the Discus (99-00) to go with a third in the shot put. Sydney Roy also helped out in the scoring at throws by placing in every event. 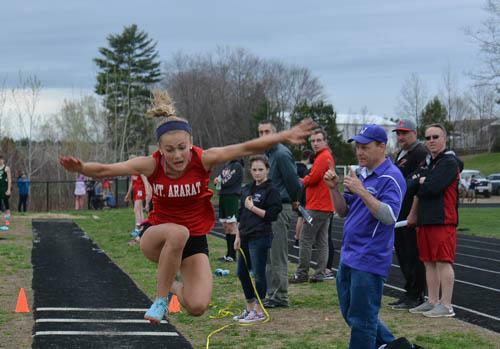 The Triple went to Wyley Fitzpatrick of Mt.Ararat who, with a distance of 34-05, put another inch on an outdoor PR set earlier this season; the sophomore is among the top five triple jumpers in the state, but it was her only event of the day. With Mt. Ararat on the track again Monday for a meet Fitzpatrick did not enter the 400 or the Long Jump where she would have been expected to perform well. Sarah Cox won the shot put with a throw of 38-06. The Race-Walk went to Lisbon's Sydney Douglass (9:22.07). With eight teams present, and six of them having large squads, the six-lane track at Lisbon was stretched to the limit. The meet ran until the light was gone from the sky. Twenty-four heats were needed to get all the 100 meter runners across the line. Leavitt will meet again at Mt. Ararat Monday the 7th to make up for a meet previously postponed by weather. Scheduled to join the Hornets and Eagles are Messalonskee, MCI and Erskine Academy. Brunswick travels to Belfast on Thursday the 10th where the Dragons will also see Gardiner and Lawrence.